Marbling is the ancient art of floating paints on the surface of thickened water (known as the “marbling size”) and then transferring this floating design onto paper or fabric. Use this traditional technique to make your own patterned fabric, one-of-a-kind wrapping paper, fine art and more. Each design is as unique as a fingerprint! 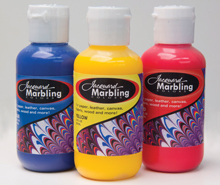 Jacquard Marbling Colors are formulated for ease of use and professional results. All colours spread equally on the marbling size and have good adhesion on any porous or semi-porous substrate. With Jacquard’s Synthetic Gall, marblers have total control of their colours and can adjust how much one colour spreads in relation to another. On fabric, Jacquard Marbling Colors are soft, permanent and washfast after heat-setting. Use Carragheenan as the marbling base. Use on any porous or semi-porous surface, including cotton, linen, silk, canvas, paper, wood and leather.